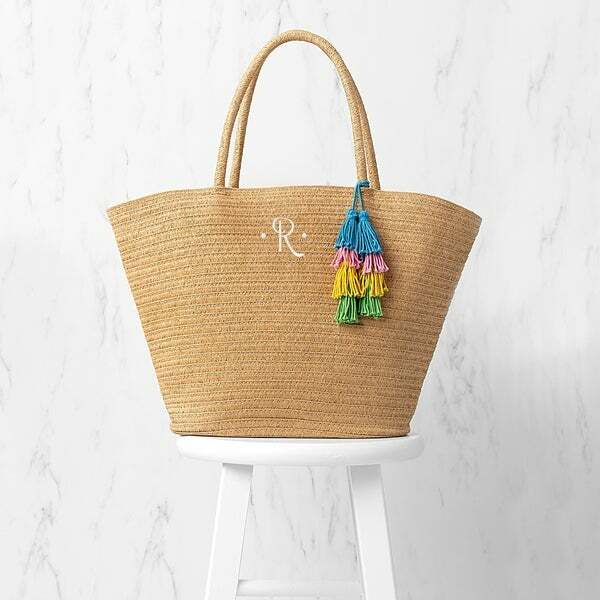 Straw Rattan Women Tote Summer Beach Shoulder Handbag Medium Size 17.8''x12.6"x5.1"
A tightly woven bag with a four color tassel, the straw tote bag is perfect for holding all your summer essentials. This tote features a beige fabric lining and two top handles. Take it to the beach, market, or library and show off this summer staple. FREE Personalization. Dimensions: L: Tote: 18.75". Handle Drop: 7.5". Inside Pocket: 7.75" W: Tote: 4.75". Inside Pocket: 4.75" H: Tote: 12" Features: Natural straw construction, ivory lining, free personalization Materials: Natural Straw Care Instructions: Spot Clean and air dry Embroidery Options: May be personalized with a single initial at no additional cost. Saw it on Nordstrom.com and it was out of stock in initials I needed, found it at overstock and I save $40.00! Top 5 Purse Styles from Overstock.com. Our guides provide customers with information about the top 5 purse styles. Hottest Bags for Spring from Overstock.com. Make sure the bag you carry over your arm during the warm season reflects the rest of your spring wardrobe. Handbags Buying Guide from Overstock.com. Use our Visual Guide to Handbags to identify your perfect bag, then read about how to find the purses that will suit your life and your style.